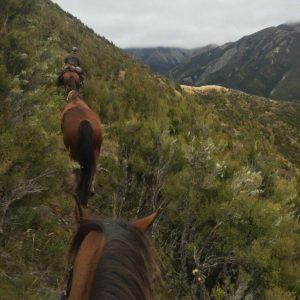 St James Routes - Part 1 - Hanmer Springs Horse Riders Inc.Hanmer Springs Horse Riders Inc. 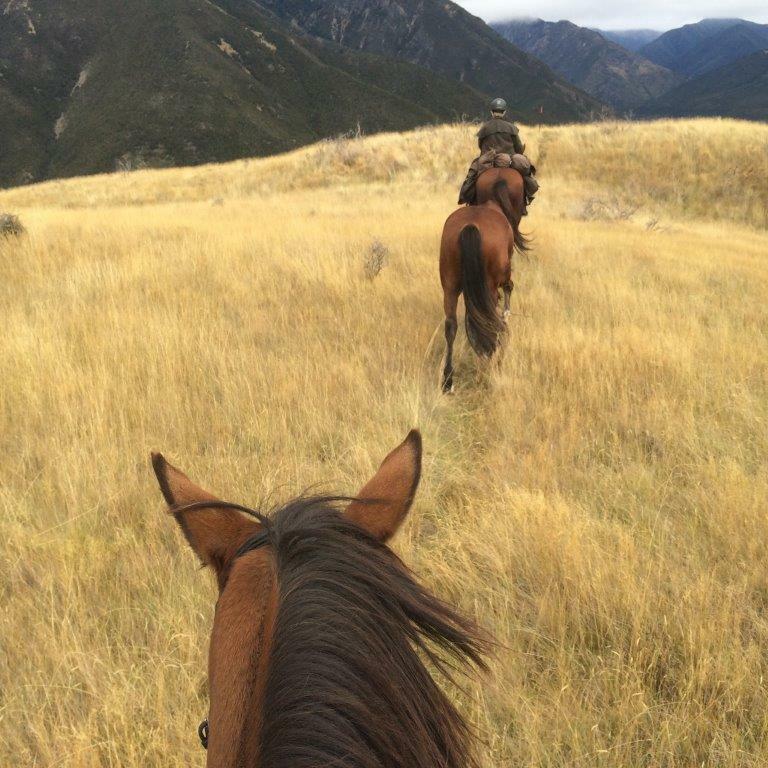 This section describes horse routes in the St James Conservation Area, with ride times and a relative grading of the difficulty. See also Part 2 and Part 3. NB All ride times are given for a medium walk speed for horses. You will need map NZTopo 50-BT4 Ada Flat. Click here. The Dept of Conservation would prefer that you don’t ride your horse on the boardwalks as they are built for mountain bike weight. Also, consider the risk of a loose nail on your horse shoe being snagged in the netting that covers the wood. Each of the small waterways that the two bridges cross are easily fordable on the up-hill side (no bogs), and the length of boardwalk at the top end of the Peters Valley is easy to ride around the side of. Please respect that this track is primarily a mountain bike track. Following the loop clockwise: follow the trail that leaves near to the shelter hut up to the top of Peters Valley. Turn right at the top of Peters Valley then join the vehicle track and follow down to the Clarence valley. Do not be tempted to leave the track to the flats on your left; they are named “Horrible Swamp” for a very good reason! When you pass the shingle pit on your right, veer left to follow the cycle trail to a small unlocked gate back out onto the road. It is 15 mins back to the homestead from here. To ride this anti-clockwise: ride up the road towards Lake Tennyson for 15 mins before going through a small unlocked gate on your left. Follow the track until it meets the vehicle track beside the shingle pit, then veer left until you get to the cycleway turn-off at the top of Peters Pass. Follow the cycleway back down Peters Valley to the homestead. Descend the rough bull-dozer track off the top of Peters Pass until you meet the main creek at the bottom of the hill. Follow this creek up until you reach a pretty waterfall. Follow the Peters Valley up to the top. Drop off the bulldozer track until you meet the Edwards Valley vehicle track, turn left. This is mainly a grassy track. 2 -2.5 hours from the homestead (you will have crossed the Edwards river twice) turn sharp left at a ‘T’ intersection in the track. 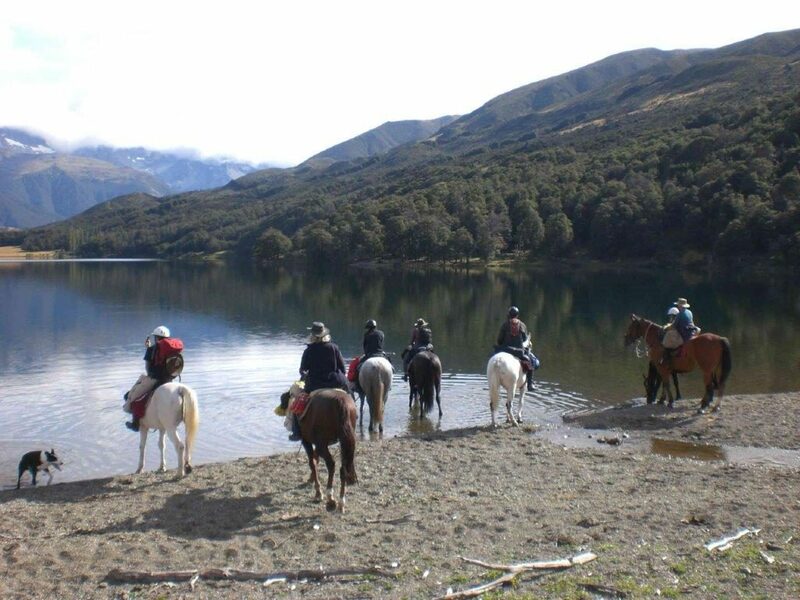 Follow the track up a steep terrace and across 2-300m of grassy flat to the hot pools. Lead your horse down to the river level to find a tie up place. 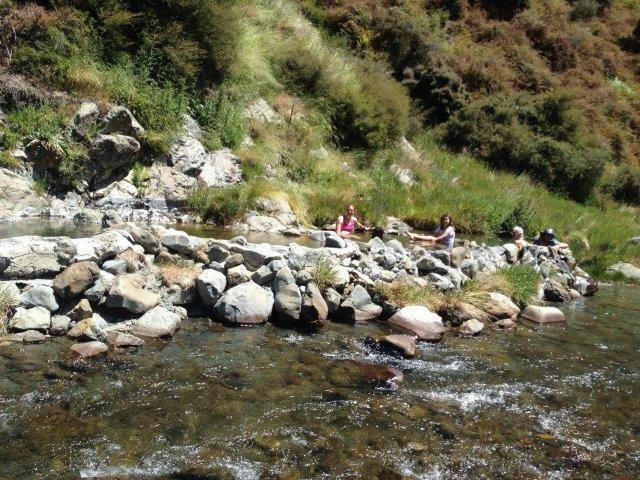 There are 4 newly built rock pools of varying temperature 20m downstream from the older main pool. Sandflies are abundant in the evening, so not a great place to camp. You will be eaten! The ‘Racecourse’ is a flat oval basin high above the ridge on the true right of the Edwards River, above Scotties Camp. It is a high route to the other end of St James which avoids having to cross the Waiau River). Follow the vehicle track that zig-zags up to Charlies Saddle. A sign-posted poled route leaves the top of Charlies Saddle towards the western (Waiau River) end of the track which sidles around Charlies Saddle. Note: this track is narrow in places with quite a steep drop off. You may prefer to dismount and lead some sections. This part of the route is not recommended in wet or icy conditions. 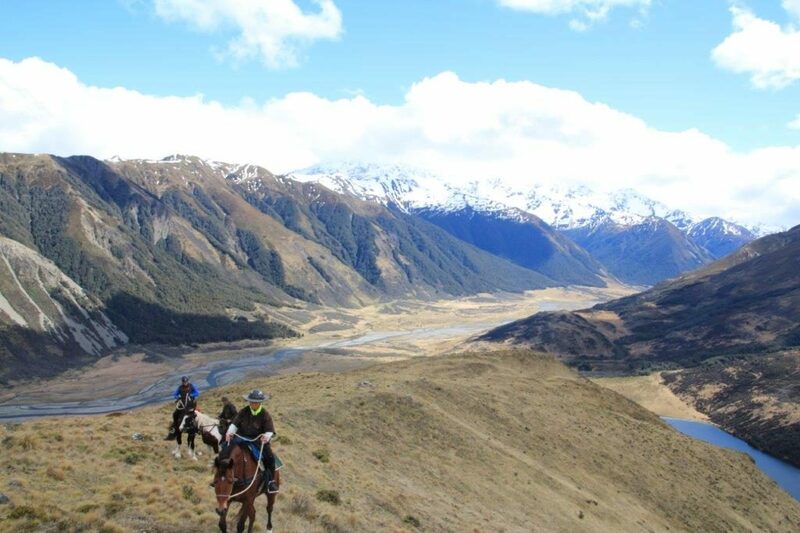 Follow the poled route to drop down to the Stanley River above its confluence with the Waiau River. Caution: stay on the track because there are many deep bogs around springs on the Racecourse which are disguised as lovely green lawns around a delightful pool of water- enticing on a hot day! 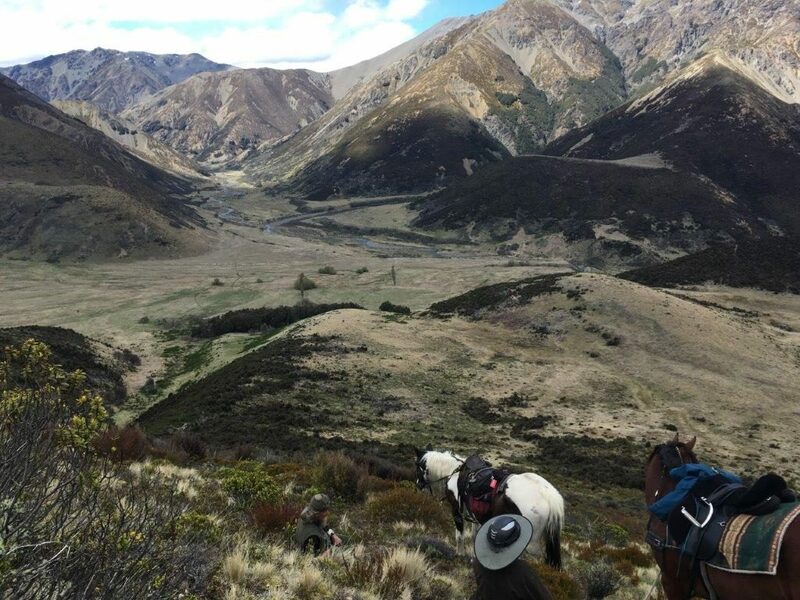 Follow the poled route up the Stanley River to Stanleyvale Hut. In late summer and autumn, the rowan trees in the upper Stanley attract many bell-birds which sound fabulous in the late afternoon and early mornings. Follow the bulldozer track up onto Glen-Rae flats behing the Hut. As you get to the top of the climb, look for some orange tape on kanuka to your left. Cross a small waterway and follow the track to the top of the hill to gaze over Glen-Rae flats, Mt Moria and across to Mt Clara. Ride around to the far (north-west) end of Lake Guyon and ford the lake outlet beside the cycleway. At the top of the hill, turn left and climb the ridge to the top of Lake Hill. (There is no marked track, but stay on the ridge overlooking Lake Guyon). Picnic at the top. Follow along the top before dropping down a ridge to the left (follows an old fence-line) down to the beech forest at the back of Stanleyvale hut. Follow the vehicle track to the North-west of the hut. Good swimming on a hot day and trout fishing!